The storm we're bracing for is the type of January variety everyone prepares for: monitor school closings, check flashlights and stock up on bread, eggs and milk. It's hard to know exactly how any storm will hit until it actually arrives. But there's a foreboding sense about what to expect in the coming days. "We had something comparable in January 2014," said Aaron Reynolds, meteorologist at the National Weather Service in Buffalo. That storm launched Buffalo's first official blizzard in 21 years at the time. Reynolds stopped just short of predicting this week would yield the same designation, but he left open the possibility. "It's too early to tell," Reynolds said. "It's not out of the realm of possibility." The January 2014 blizzard started with a blast of frigid polar air that dropped temperatures from 45 degrees to 2 degrees in a single day. It brought wild, gusty winds over 50 mph, subzero temperatures and wind chills colder than 40 degrees below zero. And, it brought 17.6 inches of snow that spanned Jan. 6-8, 2014. Like it did then, weather service headlines for this week herald the coming of a "very dangerous and life-threatening Arctic air mass." The polar blast is expected to rush behind a passing cold front Tuesday, and in combination with a southwesterly flow over the still relatively open waters of Lake Erie, it will help ripen and fuel a strong lake-effect snowstorm, forecasters said. Subzero temperatures, strong winds and brutally cold wind chills are also forecast. A winter storm warning for Erie, Genesee and Wyoming counties starts at 4 p.m. Tuesday and is scheduled to run through Thursday morning. As of late Monday, the weather service estimated snow totals are likely to be upward of 18 inches in the areas most persistently affected by the lake-effect bands. That's on top of the roughly 20 inches of snow that fell in metro Buffalo last week. Forecasters said winds could gust as high as 45 mph late Wednesday through Thursday and "may produce near blizzard conditions with severe blowing and drifting snow." "Travel could be very difficult to impossible," the weather service said. High temperatures on Wednesday and Thursday are expected in the single digits with overnight lows Wednesday below zero. Wind chills as low as minus 25 are possible in metro Buffalo. They could be even colder in other parts of the region. "The cold wind chills could cause frostbite on exposed skin in as little as 15 minutes," the weather service said. Although the frigid temperatures are expected to hasten freezing on Lake Erie – which has been lingering at 32 degrees for a week – it's not likely to happen fast enough to avert cranking up the lake-effect machine, according to Don Paul, a contributor to The Buffalo News. "As for the growing ice cover, the freezing of Lake Erie isn’t like popping an ice cube tray into your home freezer. It takes time," Paul wrote Monday. "It happens faster when winds are light. That will not be the case until Friday at the earliest. Strong winds, like strong currents in a stream, slow the icing process." Buffalo's last "official blizzard" came Jan. 2, 2018. It lasted four hours. So, how to get ready? Keeping a battery-operated lantern or battery-powered flashlights. Having a battery-operated radio handy for important news and emergency announcements. Charging your mobile phone – and any portable chargers. Making sure prescription drug needs are met. Stocking baby food, water, canned foods, a first-aid kit and food you don't have to cook like dried fruit and crackers. Meanwhile, area school superintendents said they would monitor conditions closely. 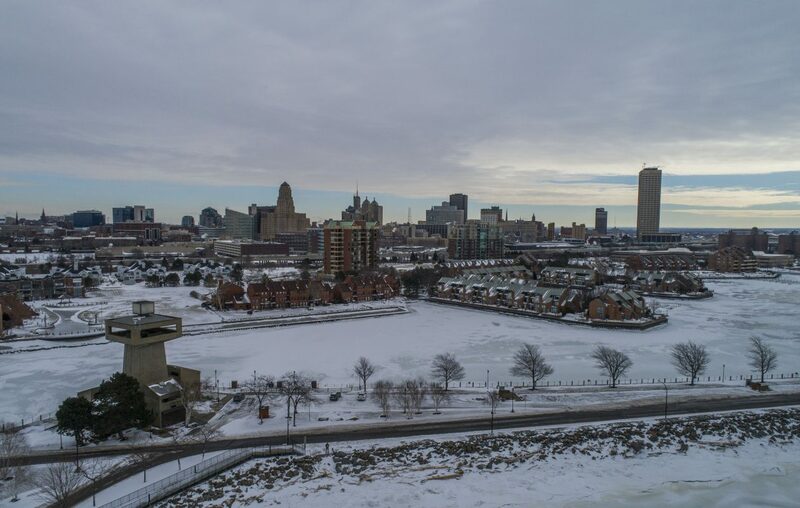 In Buffalo, district spokesperson Elena Cala said in an emailed statement that because most students are "walkers" – either to the bus stop or to their school – the district is especially mindful of dangerous weather conditions. "The decision of whether or not to close schools is based on New York State Department of Education guidance," Cala said. "When the National Weather Service issues wind chill advisories between -15 and -25 degrees, the Buffalo Public Schools will strongly consider closing." "We'll probably wait until Tuesday evening to make a decision," Laurrie said. "We don’t want to go too early. Things have been known to change." So, how "historic" do forecasters think this week's storm will turn out to be? "I wouldn't go 'once in a generation event,' or anything like that," Reynolds said. "It's definitely a significant event." News staff reporters Samantha Christmann and Barbara O'Brien contributed to this report.